Despite the warm weather I just uncorked a Bordeaux. Normally I would have poured a slightly chilled red Loire or so, but it is Michael Broadbent who made me long for a Bordeaux today. He wrote in Decanter's Bordeaux issue 2010, the highly interesting special Bordeaux issue that appears once every year. 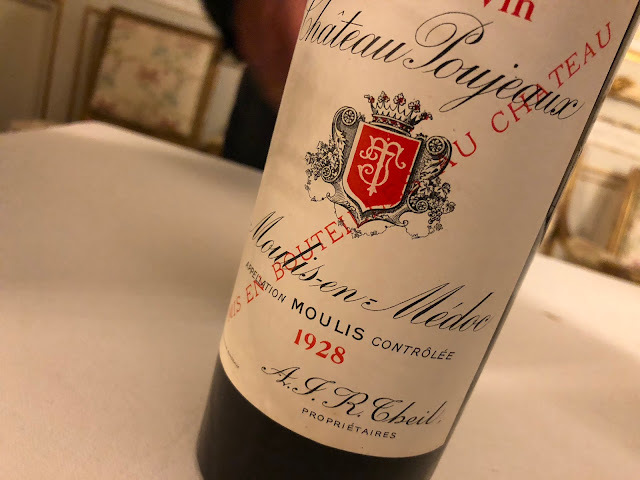 Let me quote the nestor of wine writing: "It [Bordeaux] is never overpowering; it refreshes the palate […]", and: "Claret gives pleasure; it is contemplative, companionable, subtle, mellow, hospitable. It is for drinking and thinking." Broadbent is not talking about modern style Bordeaux ("modern, opaque, sweet, fruity, full-frontal reds with a headache-making alcohol content" - Broadbent in the same article), but about the classics. Decanter asked him to list 10 favourite wines and these are the ones he picked, both top end wines and petits châteaux: Mouton-Rothschild (1945), Margaux (1953), Cheval Blanc (1947), Figeac (1949), La Conseillante (1966), Grand-Puy-Lacoste, Cissac, Chasse-Spleen, La Tour de By and Climens (1937). The fact only that one is able to make such choices…! The wine that I'm enjoying right now is Château Cambon la Pelouse 2004 (Haut-Médoc). Surprisingly good stuff. On the one hand velvety and seductive, with sweetish ripe fruit, and on the other hand leniency, freshness and joy. And a very Bordeaux dark depth. As a matter of fact, with this I simply finish this posting - to fully enjoy this lovely claret.